So many amazing people have shared many beautiful activities for Ramadhan. These are some of the activities that we have done this year, inspired by others. 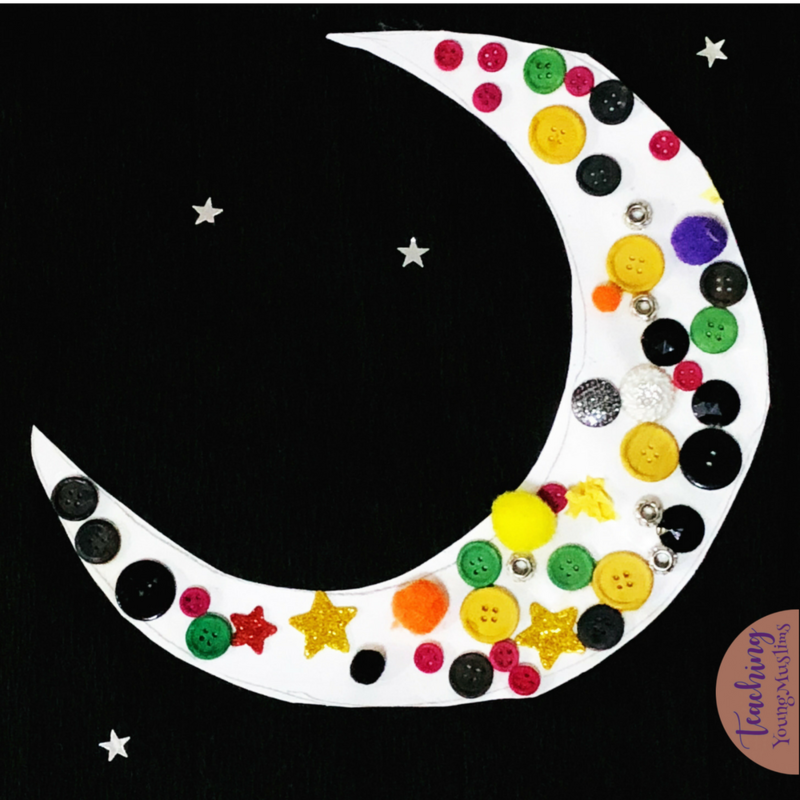 I saw this activity on Crescent Moon DIY’s Instragram Page and I thought it was beautiful! We put our own spin on it, using whatever materials we had, and this was our final result. My favorite part about this project was that it was done pretty much entirely independently. The only place where I really had to help was in drawing the initial moon shape, and then in cutting out the moon from the white posterboard and gluing it onto the black crepe paper. 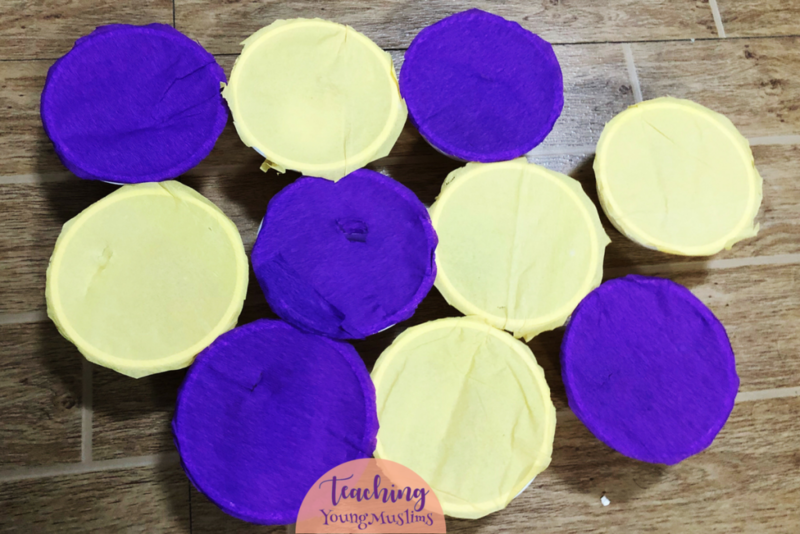 I decided to use this activity to countdown to Ramadhan, rather than for each day of Ramadhan. We started in the middle of Sha’baan, and we are using it until Ramadhan starts. What I loved most about this countdown was that my daughter could be involved in putting it together. I knew I wanted to make confetti, and we have a star-shaped hole punch that I wanted to use. My daughter spent an entire afternoon happily cutting out star confetti from like six sheets of paper. She just wanted to keep going and going and going! She loved this part so much! The next day, we built the actual countdown. I loved that it was shaped as the Ramadan Drummer’s hat, but when I pulled out my bag of supplies, I didn’t actually have cups. I tried to use a bowl and keep the method that Hello Holy Days shared, but I was struggling. After some experimenting, I decided to use the bowl as the shape of the Ramadan Drummer’s drum! My daughter filled each bowl with the star-shaped confetti that she made, then she added a piece of candy to each bowl. 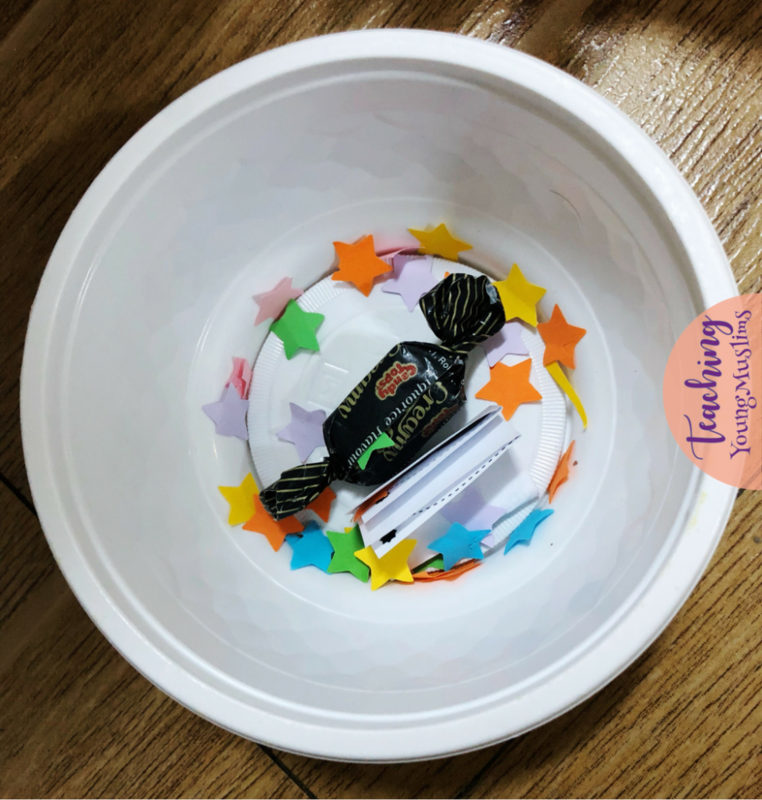 While my daughter added the confetti and the candy, I secretly chose the activities that I wanted to use out of Zair Zabr Play’s Free Good Deeds Printable, and folded them and put them in each bowl, keeping track of which activity was in which bowl so that I could number them and open them on the appropriate day. I didn’t use all of the activities – since I started in the middle of the Sha’baan, I only had space for half of them. I was impressed that my daughter didn’t try to unfold them and sneak peeks at all of them. 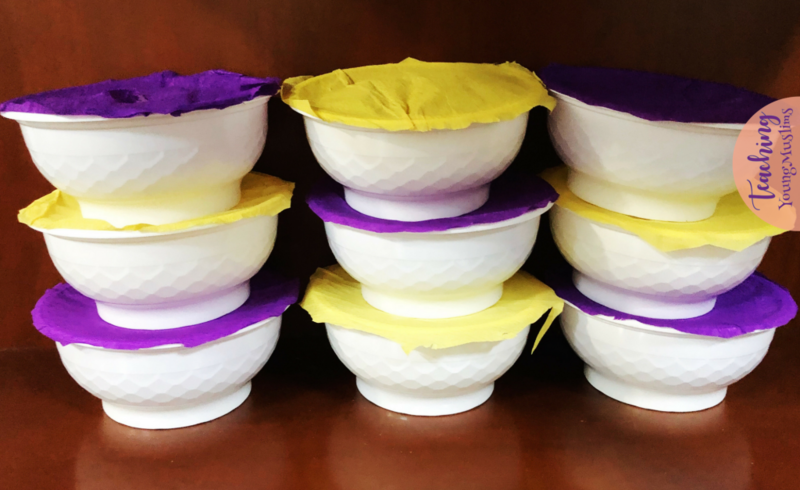 After the bowls were filled, I cut the crepe paper into small squares, big enough to cover each bowl. My daughter applied glue to the edges of the bowl with her glue stick, and we covered the bowl together. After the bowls were dry, we both trimmed the excess edges off the bowls, and our drums were ready! 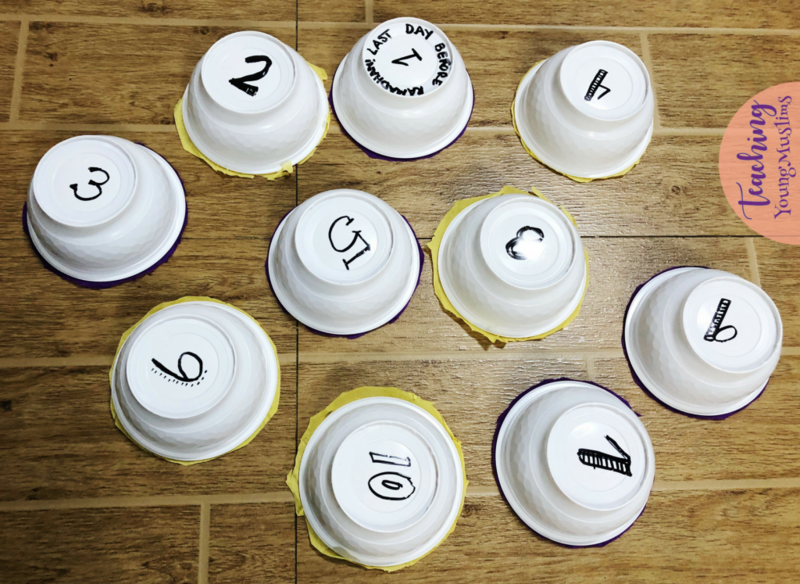 If I had number stickers, I would have put a sticker at the top of each bowl, but I didn’t, so instead I wrote the number at the bottom of each bowl, so I could keep track of which activity I wanted for each day. This countdown is a free download from Simply Ramadan. This one is MY countdown, that I’ve placed up high, out of the reach of my four-year-old’s hands. It’s pretty, and it was easy to print out and put together. Easy for me, I mean. It would have been too difficult for my four year old. Last year, when my daughter was three, we used white crayons and watercolors to make our Ramadhan banner. 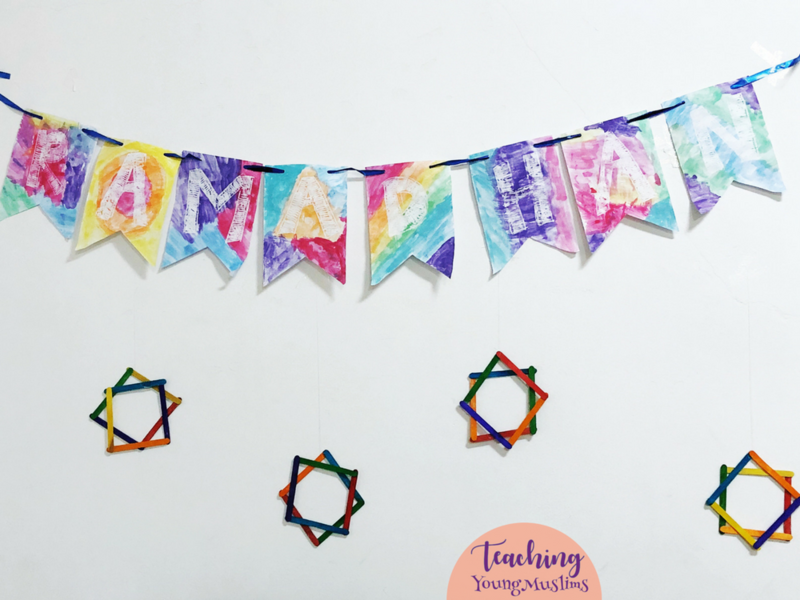 My daughter did most of the painting, and as the time for Ramadhan came closer, I was seriously surprised that my daughter remembered the colorful Ramadhan banner and kept asking me to pull it out. She was so excited when I finally pulled it out. Last year, I strung out activity cards under the banner, but since we’re not using those same activity cards this year, I decided to decorate it with eight-pointed stars instead! We had colorful popsicle sticks, so I showed my daughter what I wanted to make by doing one with her, then I let her make them pretty much on her own. They aren’t perfect, of course, but they look amazing and she is proud of them and that’s what matters! We used glue stick to make a square with four popsicle sticks, and then another square with another four sticks. Then, we overlapped them and glued them together. 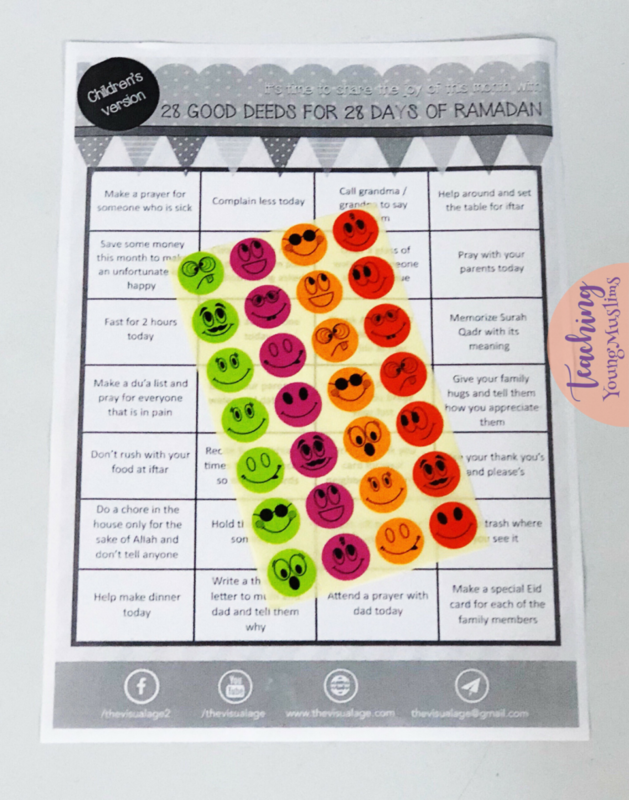 During the month of Ramadhan, we will be traveling, so I needed an activity that was easy to transport and continue in different places, so I chose to use 28 Days of Kindness Calendar from The Visual Age. I added a sheet of happy/silly stickers, so we will choose an activity to do each day, and cover the square with a sticker when we complete the activity.